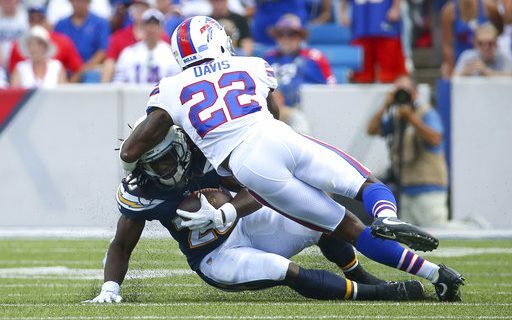 The controversial halftime retirement of Bills cornerback Vontae Davis at halftime of the Chargers game is the talk of the NFL. So why was Davis so quick to get out of town? Sports humorist Jeff Wozer has uncovered the reasons. • Upset with team’s national anthem policy ban on hula dancing. • Shocked to learn New Era Field vendors use locker room’s hot tub for boiling hot dogs. • Feared word would get out that he had Philip Rivers as his starting Fantasy Football quarterback. • During game no free Gatorade refills. • Based on his $156,000 per game salary, he felt dizzy with guilt for averaging $15,000 per missed tackle. • Feared the onset of tinnitus from New Era Field’s third down train horn. • After getting repeatedly burned in first half blamed Southwest Airlines “Want to get away” ads for planting the seed. • Team would not recognize his community ticket donation to the Hooter Girls of WNY. • Miffed that in order to use the sideline medical examination tent’s restroom he had to buy a box of Ace Bandages.